8/3/2017–MOCKSVILLE, NC–The Sugar Valley Composite Squadron marked two milestones in its four year history at the 18 July meeting. The squadron held its first Change of Command ceremony and also recognized its first Amelia Earhart Award recipient. First, the Amelia Earhart Award was presented to C/Capt Christopher Herman by the NC Wing Commander, Col R. Jason Bailey. 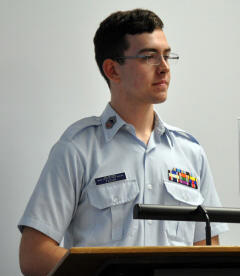 It is the third milestone of the Civil Air Patrol Cadet Program. Serving as the Squadron’s Cadet Commander, C/Capt Herman has demonstrated leadership and integrity in structuring the cadet program and emergency services training activities. Next, Maj Stephen Leighton presented Lt Col Eric Orgain with a plaque recognizing his outstanding leadership and service since the squadron’s founding in 2013. Following this presentation, Col Bailey began the Change of Command ceremony. Lt Col Eric Orgain passed the command of NC-052 to Capt Tom Conroy, who accepted command of the squadron. Lt Col Ron Cheek, Group 4 Commander, spoke briefly after the Change of Command. The evening concluded by honoring Lt Col Orgain and Capt Tom Conroy with a reception in the Blue Hangar at Sugar Valley Airport. Sixty-five guests attended, including squadron members and families and other CAP squadron members. The Sugar Valley Composite Squadron NC-052 thanks Lt Col Orgain for his four years of dedication and service to the squadron and salutes Capt Conroy as the new squadron commander. The Sugar Valley Composite Squadron meets every Tuesday, 6:30-8:30 p.m. in the Blue Hangar at Sugar Valley Airport, Mocksville.